On January 5, 1891, seventeen German Baptists organized a small congregation, the First German Baptist Church, under the leadership of Rev. F. Reichle and Rev. H. L. Dietz. 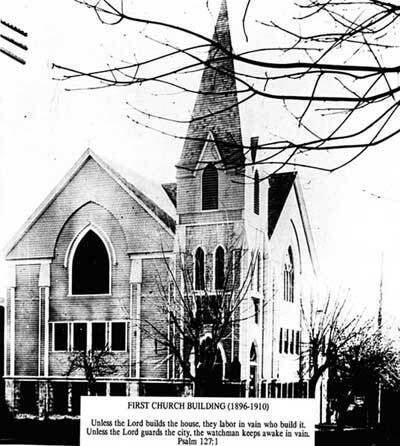 The fledgling group had been a mission of the First German Baptist Church of Bethany (organized in 1879 and now the Bethany Baptist Church) who advised the new congregation to organize in Portland. Rev. Reichle was working as a representative of the German Baptist Mission in Oregon. Initially the congregation held worship services in apartment of Rev. Reichle at 69 Baker Street and soon moved to the Sunday School room of the First Baptist Church (English speaking), which was then located on southwest corner of Fourth and Alder in Portland. Prayer meetings were held in the private residences of members. In October 1891, Rev. Reichle resigned because he felt that the minister in Portland should be able to speak both English and German. Rev. Dietz recommended that Rev. W.C. Rabe of the Second German Church of Rochester, New York be called to serve the congregation. Rev. Rabe accepted the call, but did not assume his duties until July 1892. Rev. Rabe was commissioned by the American Baptist Home Mission Society (ABHMS). By January 1893, the congregation had increased by 75 people and Rev. Rabe established four branches of the church in other parts of the city. In 1896, the growing congregation purchased land and built their own church on the corner of Fourth and Mill. A new church building, seating 600 people in the main gallery, was dedicated on July 25, 1897. A furnace and furnishings from the old First Baptist Church were donated by Mr. Henry Failing. Rev. Rabe resigned as pastor in the summer of 1896 and returned to his work in the Eastern United States. Rev. Jacob Kratt, with support of the ABHMS, became pastor of the church in July of that year. Under Rev. Kratt's leadership, the congregation continued to expand and the church structure was enlarged in 1910. The original First German Baptist Church building (1896-1910) on Fourth and Mill. The expanded First German Baptist Church on Fourth and Mill circa 1911. The branches that Rev. Rabe and Rev. Kratt had begun in the outlying communities around Portland bore fruit with the arrival of German speaking immigrants from Russia who settled in Albina. About 1898, Rev. Kratt established a mission in Albina, a former city located on the east side of the Willamette River that was incorporated into Portland in 1891. There were many German speaking immigrants living in Albina at the time. A significant factor in the early growth of this mission was a decision by the Mennonite Brethren, who had first organized in 1891, to disband their own church in Albina and join the Albina German Baptist mission. Thirty-three members of the Mennonite Brethren Church were accepted as members of the Second German Baptist Church on experience of their faith. Subsequently, the meetings of the Albina Baptist Mission were attended by 75 to 100 people, a mixture of German speaking people from Western Europe and from Russia (Volga Germans). Unfortunately, within a short time, a group of members who had originally belonged to the Mennonite Brethren Church broke away to form their own congregation. This group was organized as the First United Mennonite Baptist Church and they built a small house of worship at 3524 NE 6th Avenue in 1910. Despite this setback, Rev. Gustav Eichler from the Salt Creek Baptist Church near Dallas, Oregon was called to be the missionary for this group in 1901. On, July 17, 1902, thirty-seven people (including thirteen teenagers) organized as the Second German Baptist Church under the chairmanship of Rev. Kratt. The church selected Rev. G. Eichler to be its first pastor. The first gatherings were held in a store on Russell Street and then moved to a location at Union Avenue and Knott Street. Later the congregation met in a small church which was located between Stanton Street and Morris Street on Rodney Avenue. Later, the congregation purchased a 3,571 square foot lot on the northeast corner of Rodney Avenue and Morris Street for $925. The small group had financial assistance from the ABHMS, and also the personal assistance from Conrad Wyss, who acted as Sunday School Superintendent, and Rebecca Kleinau, who acted as organist, both members of the mother church. The first organ cost $25. Hymnbooks were ordered, one dozen with musical notes and two dozen without notes. At the end of 1903, Rev. Eichler left the church to serve a congregation in Tacoma, Washington. In the interim, Rev. Reichle, who had organized the First German Baptist Church, served the congregation without remuneration. Soon after the arrival of Rev. Bueermann in 1903, the construction of a church building and parsonage began on the lot at Rodney Avenue and Morris Street (construction began in 1904). There were about 140 members at this time. Rev. Bueermann was born in Hannover, Germany (1865) and came to America in 1879. He was called from the First German Baptist Church of Cleveland and became a beloved pastor of the church in Albina. 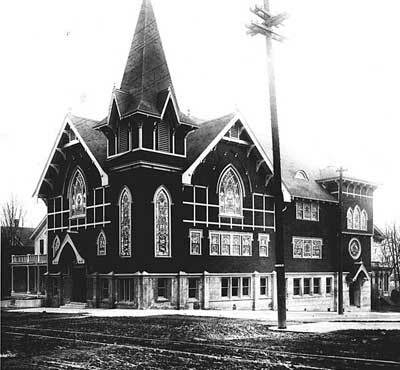 On Sunday, January 8, 1905, the first service was held in the newly completed Second German Baptist Church. Rev. Kratt provided the first sermon in this church along with messages from Rev. Bueermann and other German pastors. Designed by architect Philip Chappell Browne, the 45 foot by 65 building cost $5,000 and included a basement, kitchen, furnace and gas lighting. Rev. Bueermann put great effort into financing the new church building and assistance was provided by members of the First German Baptist and White Temple churches. The newly formed church was self-supporting by around 1910. The church showed excellent progress and did fine work among the many German-speaking people who had settled in the Albina area. 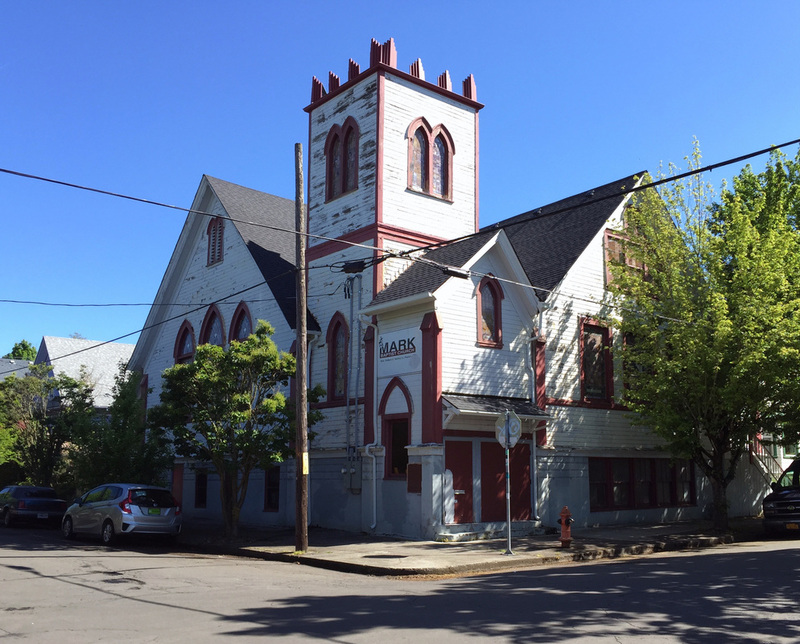 In 1906, the First German Baptist Church began a new mission in East Portland and in 1907 another mission in St. Johns, at that time a suburb of Portland. Between 1905 to 1910, In 1905, a similar break away occurred when 25 members of the Salt Creek Baptist Church left to form a Mennonite Brethren church. Reportedly, some of them returned to the Salt Creek church shortly thereafter. Rev. Bueermann continued his ministry until 1915. It is interesting to note that he gave instruction in German reading and writing in addition to Bible studies for children. Rev. Paul Meier succeeded Rev. Bueermann on August 1, 1915. Rev. Meier married Miss Emma Bertuleit, and only three days after his marriage, and one and a half months as pastor, he died in the parsonage. Rev. Frederick Hoffmann became the pastor in 1916 and served ten years. About 1920, the church made extensive changes to the building. Work was done on the entrance, platform, and basement, and a pipe organ was installed. The total cost was $12,000 and the projects were led by Rev. Hoffmann. Rev. Rutsch replaced Rev. Hoffmann in 1925. He was noted for giving instruction in German on Saturdays. While he was pastor the church reached its peak membership with 257 members despite the fact that over 30 members had been lost to the mother church (First German Baptist). By 1927, the church began to lose families to English speaking churches. In 1927, Rev. Rutsch left for the Salem Baptist Church, and was followed by Rev. Wuttke. Rev. Wuttke conducted evening services in English. A radio ministry in the German language was conducted along with the First German Baptist Church and the Bethany Baptist Church. Rev. Wuttke left the church in 1931 and was followed by Rev. Buenning who served for one year, and in turn was followed by Rev. Wahl who joined the church in 1933. Rev. Wahl conducted the morning services in German, but English was used in the evening. The German language radio ministry continued. Rev. Wahl left the church at the end of August 1937. Around 1937, the name of the congregation was changed to Immanuel Baptist Church. Photograph of a Sunday School classes or Vacation Bible School class at the Immanuel Baptist Church taken between 1937 and 1953. Photo courtesy of Virginia Millar (née Schott). In November 1937, Rev. Roth began his ministry at the Immanuel Baptist Church. The church was improved with new elm pews, four classrooms, and art glass windows, all at a cost of around $5,000. After World War II, the church sent large quantities of food and clothing to those in need in Germany. Reverend Roth left the church in 1951. Rev. Henry Barnet began his work as pastor in November 1951. A men’s organization was formed in the church and in 1952 the church celebrated its 50th Anniversary. In 1953, the church membership made a decision to build a new building at 8311 NE Prescott St. This church remains active today as the Mennonite Brethren Primera Iglesia Hispana Ebenezer Church. The former Immanuel Baptist Church at 103 NE Rodney became St. Mark Baptist Church. The St. Mark church was founded in 1964 under the leadership of Rev. E.C. Wilder and was dedicated in 1973. As of April 2015, there is a permit application to convert the building to a residential duplex. St. Mark Baptist Church. Photograph courtesy of Steve Schreiber, April 2015. The First German Baptist Church relocated from SW 4th and Mill to 2700 SE 67th Avenue, changing their name to Trinity Baptist Church. The congregation is currently known as Trinity Fellowship. Mattoon, Charles Hiram. Baptist Annals of Oregon, 1844-1900. Vol. 1. McMinnville: Oregon State Baptist Convention, 1913. 154-155. Print. Mattoon, Charles Hiram. Baptist Annals of Oregon: 1886-1910. Vol. 2. McMinnville: Oregon State Baptist Convention, 1913. 410. Print. Nelson, Donald R. The Bethany Community: As It Was...and Is Today. S.l. : Donald R. Nelson, 2007. 20-23. Print. “Dedicate German Church”, The Oregonian [Portland], 07 Jan 1905: p. 14. “New German Second Baptist Church”, The Oregonian [Portland], 29 Jan 1905: p. 32. “First German Baptist Church to Observe Anniversary”, The Oregonian [Portland], 09 Jan 1916: p. 10. “Church Observes 25th Anniversary”, The Oregonian [Portland], 10 Jan 1916: p. 14. "Obituary - Friedrich Reichle", Der Sendbote [Publication of German Baptists of North America}, 26 Oct 1921.